Can I Store A Mattress In A Storage Unit? Storage units are a great way to outsource your storage needs when you either don’t have the space at home, need something for a specific purpose, or a specific time of year, or are relocating to a temporary location and don’t want to bring your entire life with you. One question that people frequently ask is whether or not they are able to store a mattress in a storage unit. The short answer is: yes, but there are some considerations to keep in mind to make sure that you are storing your mattress properly and not doing damage to this expensive piece of furniture. Protect against the elements. Protecting a mattress from the elements, namely humidity, is key. If you are storing a mattress in a climate where you know humidity is a factor, make sure that the mattress is properly sealed with plastic wrap and eliminate the chances of it becoming damaged, or unusable because of mould and mildew. Don’t store anything on top of your mattress. This means that if you are planning on storing your mattress, you can only store it if it is going to have ample space to itself. If your mattress is going at the bottom of the pile of whatever it is you are storing, it will damage the structural integrity of your mattress. Long term storage. If you are planning on storing your mattress long-term, you will need to make special preparations for it. Keeping a mattress in a storage unit, long-term, in an upright position or on its side can cause damage to the springs and coils, which could mean back pain for you when you go to try and sleep on it again. It should be stored flat against the ground in addition to having it properly packed and sealed while you are not using it. The bottom line is, you can keep a mattress in a storage unit, but there are some precautions that you will have to take to ensure that it is still usable when it comes out. 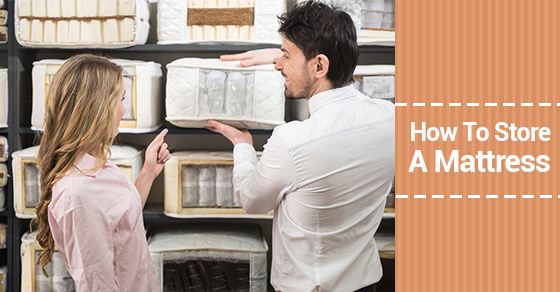 Humidity is the number one culprit when it comes to mattress damage while in storage. The next main factor is structural damage. Keeping your mattress stored in the incorrect position, or with heavy items on top of it can ruin a mattress quickly, especially one that is especially designed for your body. If you are considering placing a mattress in storage, keep the above considerations in mind and ensure that your mattress survives the storage and emerges just as it was when it went in, ready for you and your family to use for years to come.